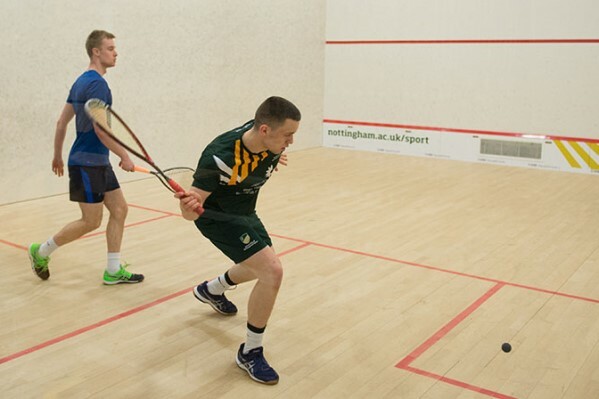 University of Nottingham Men’s 2nd team lined up as favourites in the Trophy final against Sheffield Hallam – they finished second in their league and has only been beated once in the 2017/18 season. With the home advantage firmly in their favour, it was their game to lose. First up on court was Nottingham’s fifth seed, Jack Dukes and the beginning of the game was extremely tense. Neither player could push ahead more than a point as the score yo-yo ed back and forth. Unfortunately it was Dukes who lost out and Sheffield took the first set 11-9. Dukes quickly fought back in the second set with some excellent game play winning his match again 11-9 and making the score 1-1. In the third set Sheffield took an early lead, but with Dukes never far behind. Again, however it went Sheffield Hallam’s way – 2-1 to them. Despite some amazing shots from Dukes drawing applause from the crowd, he eventually succumbed to defeat and Sheffield took an early 1-0 lead in the fixture. Up next was team captain Nick Ratnaraja. His first set looked comfortable with an 11-5 win, followed by 11-8 in the second. His opponent rallied and pushed back to take the 3rd 12-10 but Ratnaraja stayed strong, refocussed and returned to form, closing the game off 11-6 and sealing the victory. On third was Charlie Gamble. Despite losing the first set a noisy #GreenandGold crowd gave him the boost he needed and he sped through the second and third set, 11-7 and 11-4 respectively. The final set saw the same tactical shots and fast movement from Gamble to win again 3-1 and making the overall score 2-1 overall to Nottingham. Next up was Laurence Green and the pressure was on – were he to win the game, that would seal the Trophy final for Nottingham. However, Sheffield took an early lead taking the first two sets. In the third set, Green took a big lead and finished off the set 11-4 followed quickly by an 11-7 win in the fourth. The momentum was then firmly behind Green, as were the crowd and he confirmed the Trophy win with an 11-8 victory in the final set! In the final match was Ben Windle, who played very confidently throughout his whole rubber. He took an 11-8 win in the first set and then ramped up the pace to take the second 11-4 and make the scoreline 2-10. His Sheffield opponent did come back to take set back, but Windle remained unfazed and with the overall victory already in the bag, he took the final set and game 3-1. BUCS Big Wednesday: Women’s 1st team retain Championship Squash title!